Art book based on Color Warz board games and miniatures. Illustrated by Max Berthelot, Kev DC (Gob'z'Heroes) and Gius. After 10 years of hard work on this project, we are proud to present to you this book that will include all the background and design of Color Warz universe. Artbook, cover by Makushiro / Book mockup, cover design not final. Through early sketches to final printed version discover over 40 original characters and fabulous landscapes described by authors. Interior mockup, design and copy not final. Work in Progress. Please, note that the informations below are not binding and could vary with production and shipping contraints or campaign success (number of pages). How your money will be used ? Color Warz - MiniZ first set / Sculpted by Rémy Tremblay and Painted by Christophe Bauer. It is now time to make a great book with all our work ever made and much more. In this Artbook you will discover unpublished sketches and designs as well as exclusive stories. If you have a Collector pledge, adding €60 instead of €110 will allow you to replace the current models by the complete sets of 25 models. You must check FAQ to order MiniZ if you have a "Kadamas" pledge. You must check FAQ to order MiniZ if you have a "Kadamas" pledge. Picture of the 25 resin miniatures included in this add on (in green, unpublished MiniZ). You must check FAQ to order Postal Cards if you have a "Kadamas" pledge. We will use Backerkit after the campaign ends. This will allow us to manage pledges and to propose post campaign add-ons for those of you wanting extra books, miniatures, post cards and other items. We work with a talented team !! My personal work plan for paint, draw and write. That's me ! the guy behind FLUO Craft :) I am a French Game Designer and graduated from ISART Digital Paris (one of the best video game schools in France). With the students team I managed, we won a gameplay price for our prototype "Color Warz" in 2006. I taught board game design at ISART Digital during 2 years, and then created and managed FLUO Games for the next 3 years to publish my first game : Color Warz Paint Brawl with Nicolas Tézé with 25 high detailed resin miniatures. Our second game, Color Warz : Dark Threat, was not published yet. Last January I was part of a great Kickstarter campaign for my third game: Gob’z'Heroes - The Game that I created with Antoine Roffé (Skulls Mini / Lumberjacks 274% funded). I recently founded FLUO Craft to bring Color Warz back and make new wonderful projects with your help ! Giuseppe (1979-2012) was a talented illustrator and a friend that worked on Color Warz since April 2008. Since his childwood he liked illustrations, comics, role playing games and video games like La Quête du Graal, Tolkien, Dark Crystal, Labyrinth, Warcraft 3 or Neverwinter Nights. He liked to dance Salsa and to draw Spaceships and Childhood atmospheres. He worked on some board games like: Capharnaüm, Ultrium and also Color Warz - Paint Brawl. He has a great understanding of colours and lights. His illustrations emit a lot of poetry. Sadly, he passed away in 2012 in Grimbergen (Belgium). This Artbook will be dedicated to his memory. Regarding Kickstarter, this is my third campaign. The first took place in 2013 (Color Warz : Dark Threat) and was not funded for many reasons. However, the second, which took place in early 2016 (Gob'z'Heroes - The Games), was a huge success. The book will be printed in Europe by a company specialized in printing solutions, with whom some of the team members have already worked with. Texts and scenarios will be written by main authors / creators : Fabien Friess and Nicolas Tézé. Concerning the delivery term, it is set for October 2016 which gives use time to ensure the production of the various book elements as well as the production of some specific illustrations. At this moment 85% of the game illustrations are ready and 50% of the text is written. We will let you know about all the steps of the process and how it is going. So you will know exactly where we stand. This Artbook is the first of a collection that we are working on. We will be particularly focused on it because it will fix the bases and foundations of this new collection. We worked more than 10 years on Color Warz so you can trust us that we will put our best in this book. 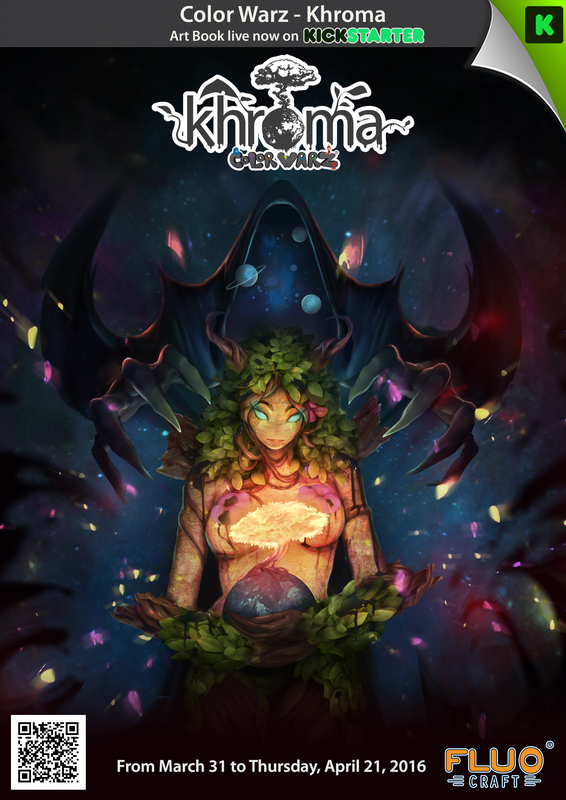 [Kadamas] A digital download of Color Warz - Khroma Artbook including all Book Updates but no stretch goal or gratifications. [Early Khromaz] A hardcover copy of Color Warz - Khroma Artbook + all Book Updates + 1 exclusive postal card + 1 original polaroid from the Kickstarter movie. [American Khromaz] A hardcover copy of Color Warz - Khroma Artbook + all Book Updates + 1 exclusive postal card. [Khromaz] A hardcover copy of Color Warz - Khroma Artbook + all Book Updates + 1 exclusive postal card. [Khromaz Chief] A hardcover copy of Color Warz - Khroma Artbook + all Book Updates + 1 exclusive postal card + 1 numbered etching of the World Tree. [MiniZ] A digital download of Color Warz - Khroma Artbook including all Book Updates + One MiniZ Collection box (25 resin miniatures). 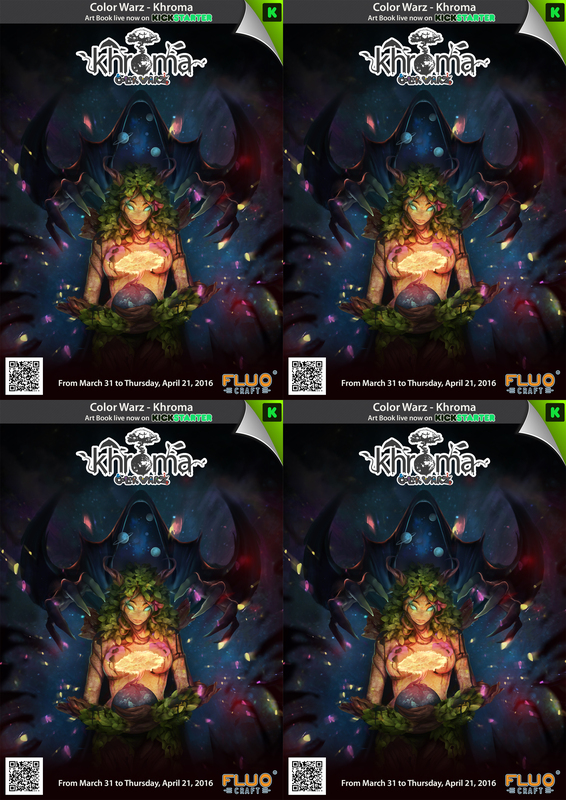 [Collector] A hardcover copy of Color Warz - Khroma Artbook + all Book Updates + 1 exclusive postal card dedicated by authors + 1 original polaroid form the KS movie + 1 numbered etching of the World Tree + 1 Color Warz Paint Brawl game box + 10 Color Warz MiniZ resin miniatures. [ISART Digital Paris] 100 hardcover copies of Color Warz - Khroma Artbook with specific and limited over-cover + all Book Updates. of the person(s) of your choice + The original engrave plate + 6 Color Warz Paint Brawl game boxes from authors personnal collection + 36 Color Warz resin miniatures Pro Painted by Color Warz studio painter with transport box.